Last Wednesday, I stopped by the florist to pick up a flower for my desk. I’m trying to rush spring so my first choice was daffodils, but they didn’t have any. 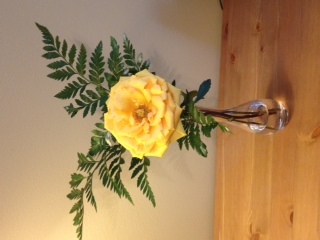 I decided on a single yellow rose, but again, no luck. I noticed a pretty pink rose beginning to open in the cooler. When the florist realized I would consider a more mature flower, she offered me a yellow rose they’d rejected as too open. It was beautiful, fully in its prime. Since I only wanted something to last through the next day, I bought it. She gave it to me for half price because she hadn’t expected to sell it at all. I brought the flower home, trimmed the end, put it in a bud vase and set it on my desk. This was last Wednesday. I enjoyed it as I worked that day and again on Thursday. Friday, I was away from my desk all day and I didn’t visit my office during the weekend. I never even thought about the rose. But today is Monday and look at it. It is still beautiful, still bringing me joy! So often, roses delivered fully closed drop their heads without ever taking time blossom before they wilt. How did it happen that tightly closed rosebuds became more desirable than mature roses in full flower? I don’t think anyonewho saw my rose would prefer the rosebuds that are much more common today. I probably won’t get so lucky next time I want some cheer for my desk, so I’ll have to figure out how to coax this beauty out of one of those roses with potential. This entry was posted in Family, Home, Traditions, Uncategorized, Working at home. Bookmark the permalink.